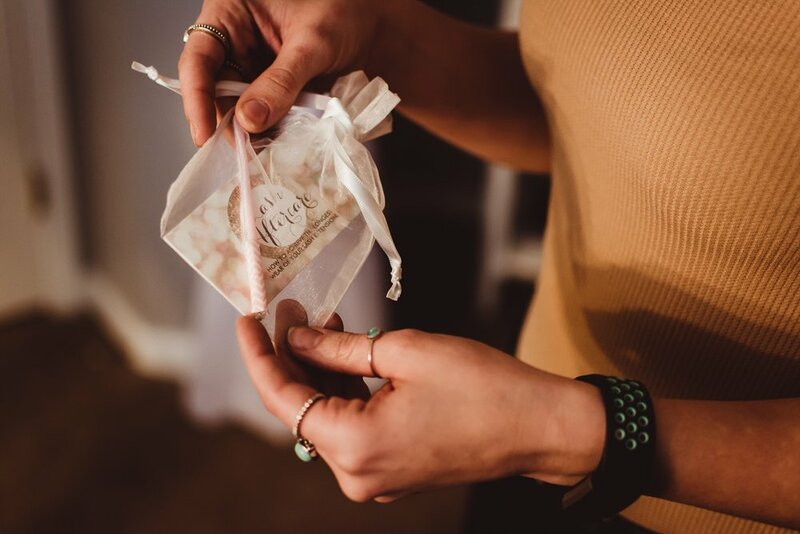 When you work in the wedding industry, you'll often come across some amazing vendors that you truly enjoy working alongside. Two years ago I met Natalie and she became one of those legendary vendors I've adored to work with and have recommended, ever since. She was one of the makeup artists for my sister in law's wedding and between her flawless work and wholesome spirit, she's a no-brainer for any bride wanting to look, and feel beautiful on their wedding day. 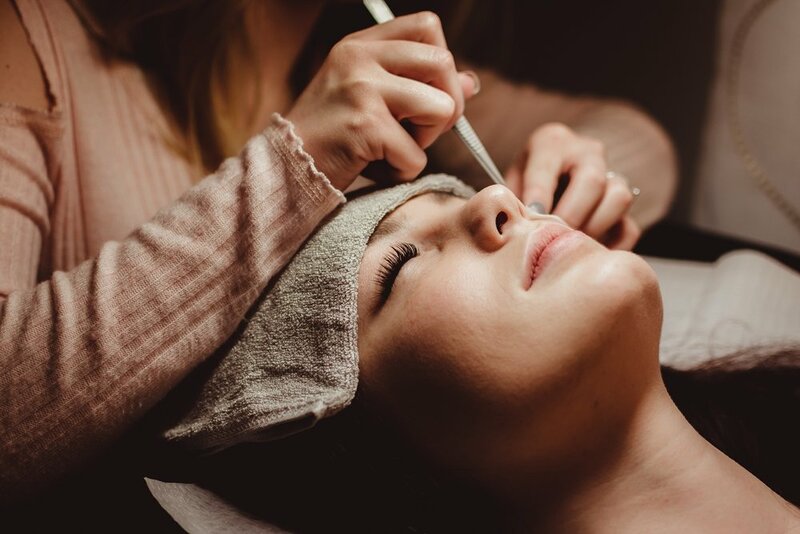 After launching lash extensions last year, Natalie has been absolutely killin' it with her business, getting booked up nearly every day when she's not out glamming up bridal parties on the weekends. 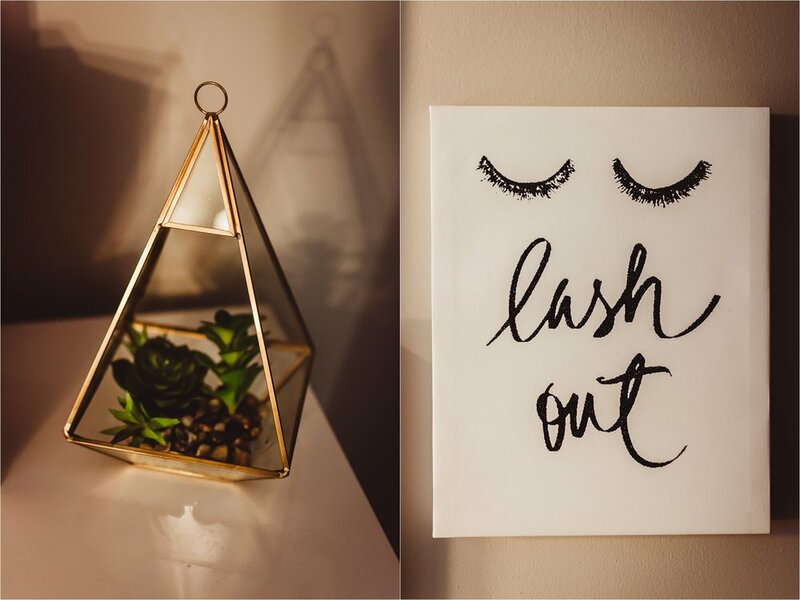 The sweetest host, Natalie welcomed me into her stylish decorated home studio with a big hug and I was able to see first hand how she applies lashes. By the end of the session, I couldn't believe how natural her model Cait looked with them on! I just had to feature her and ask her some helpful questions for anyone wanting to take better care of their skin, wanting to step up their makeup game, or interested in lash extensions. Thank you Natalie, for being a part of my Vendor Spotlight series and giving future brides some great tips! Q: HOW LONG HAVE YOU BEEN IN BUSINESS WITH NATALIE HARRIS MUA? It’s hard to believe it’s been almost 5 years since I started Natalie Harris Makeup Artistry. Time really does fly when you’re doing something you love! Growing up, I had two older sisters who were always doing their hair and makeup, I put a few things together along the way just by watching them! But it wasn’t until I was about 19 that I explored doing makeup professionally. I started by doing my friends and sisters makeup, and doing my makeup a lot of different ways! I made sure to always post a picture, to show my work! Friends on social media saw my work and then the inquiries just kept on coming! Q: WHAT IS MOST IMPORTANT TO YOU WHEN WORKING WITH A BRIDE FOR HER MAKEUP NEEDS? Q: IF YOU HAD TO DESCRIBE YOUR BEAUTY WORK IN THREE WORDS, WHAT WOULD THEY BE? 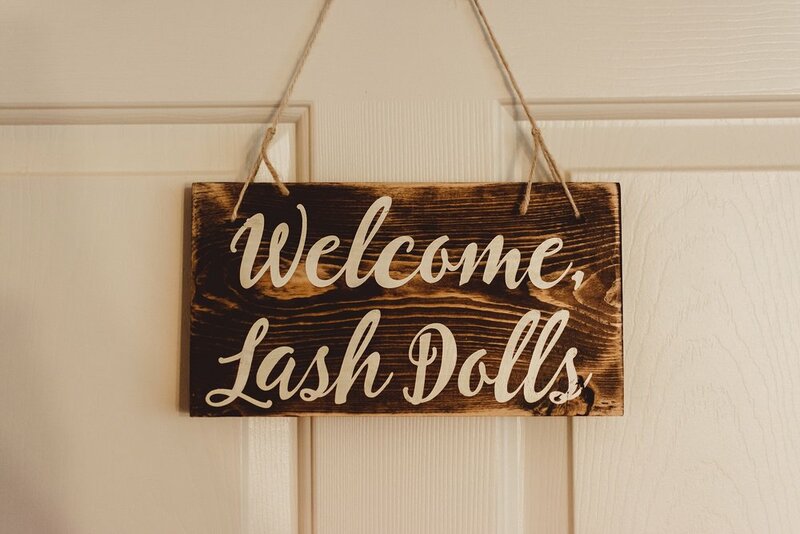 Q: FOR THOSE WHO DON'T KNOW MUCH ABOUT LASH EXTENSIONS, WHAT ARE THE KEY PROS TO GETTING THEM DONE? WHAT SHOULD YOU REMEMBER WHEN WEARING THEM? They make life SO easy! You can do nothing to your face and be completely ready and presentable for the day! They’re amazing because you literally wake up looking glammed up. They’re perfect for people always on the go, or people that don’t have time to get ready for work in the morning! You just have to be careful not to rub your eyes or sleep on your face! Q: WHAT ARE SOME GREAT BRIDAL LOOK RECOMMENDATIONS, PER SEASON? I always love a classic and soft eye with warm, neutral tones. I’m also all about diffusing the eyeliner with a little bit of eye shadow! It’s my go-to look, no matter the season. Q: WHAT'S THE BEST SKIN AFTER-CARE TIPS FOR REMOVING MAKEUP DAILY / POST WEDDING? I always say “you only get one skin, so take care of it!” Be gentle with that makeup wipe! Apply eye cream and moisturizer every morning and night! Last but not least, drink LOTS of water! Q: WHAT ARE YOUR FAVORITE MAKEUP PRODUCTS AND WHY? It hydrates the skin while providing oil control, so it’s perfect for long wear! I buy these in bulk, they are my go to lash for all eye shapes and all different looks! Provides an absolute flawless finish, with build-able coverage. It’s formulated for long wear, and known for its comfortable, light feel! Q: WHAT OTHER TIPS + TRICKS WOULD YOU WANT ANY CLIENT (WEDDING OR OTHERWISE) TO KNOW? Use lip scrub! It gets all the dead skin off of your lips so that the product on top looks super smooth! 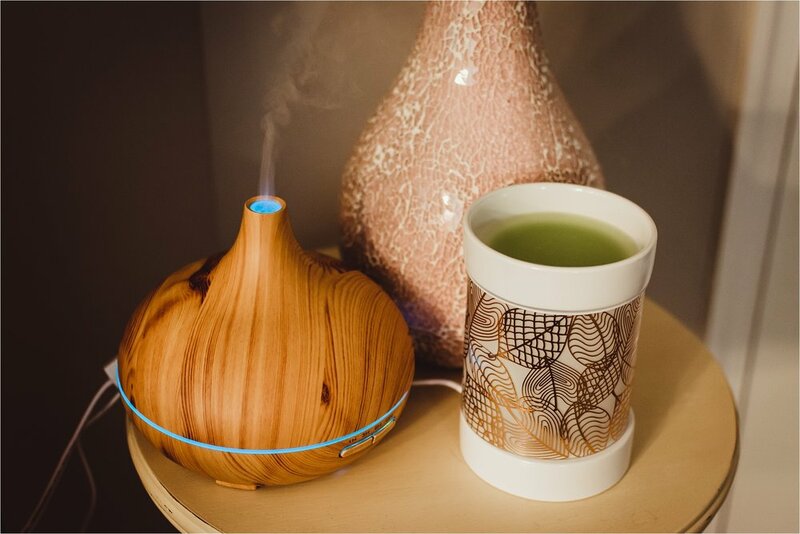 You can even make one yourself, just search it on Pinterest!